Peerless exterior. A solid 6AL-4V titanium alloy shell secures the high-grade components within. A tough and functional connector can still be fine art, thanks to the chamfered edges and circular-polished finish. 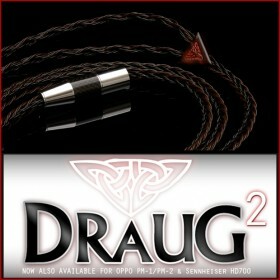 The back cap of the XLR connector features engraved rings for a secure grip and includes a silicone grommet to seal the connector. Traditional CNC machining is not adequate for this connector. The internal grooves must be wire discharge machined–slowly eroded by an ultra high voltage plasma electrode a few microns at a time. This laborious process means that it takes almost a day’s work to complete just one part. Peerless customization. In keeping with Eidolic’s 2018 titanium revolution, the modular design allows for a choice of central insert, which slides into place during assembly and is retained by the titanium back cap. We anticipate an array of insert materials going forward. Currently, the Peerless 4-pin XLR includes a finely-engraved aluminum insert (available at launch, choice of dark alloy-plated or high polish silver aluminum finish) or carbon fiber with blue metallic woven filaments (late 2018). Peerless insulation. Most XLR connectors use varying grades of plastic (glass-filled PBT or Delrin) or even entry-level Teflon formulations (PVDF) but the gold standard for polymers is, and will continue to be, PTFE Teflon. It is the most stable material for CNC machining but also offers the strongest heat resistance for soldering and the most effective dielectric constant for high electrical performance. It is because of these qualities that we selected PTFE Teflon for our connectors—it will not have any impact on signal quality, nor will it scorch, melt, or otherwise corrode with time. Terminating a cable with these connectors is a worry-free process as even liberal applications of heat will not damage the pin-insulator interface. 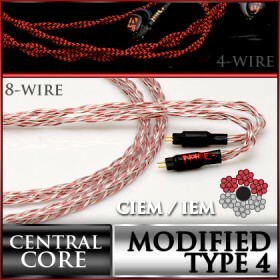 Despite being a boutique connector, it is equipped with industry-standard chuck type strain relief for cable retention, so glue is not typically necessary. Peerless contact pin material. The humble stage-grade XLRs use brass pins, while plenty of high-end XLRs use bronze pins and the Eidolic E-T4PR connector uses tellurium copper pins. These offer ascending conductivity and performance, with a very select few of the industry’s most expensive connectors using pure copper pin material (~100% IACS conductivity). 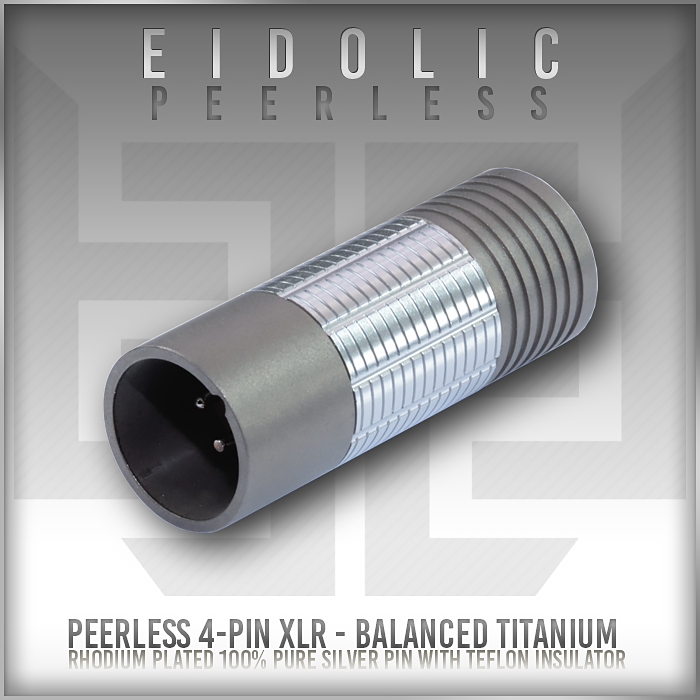 The Eidolic Peerless 4-pin XLR is the first production 4-pin XLR to use 99.9% pure fine silver for its pin material – an extravagant metal stock that is painfully slow to machine owing to its relative softness. This material, at over 106% IACS conductivity, puts this connector at the absolute limit of electrical performance. When used with the world’s best headphone cables, the perfect signal path is further extended. Peerless plating. We chose rhodium plating for this model due to its combination of conductivity and stability. A bare, unplated silver pin or silver-plated copper pin is fine at the outset, but requires continuous maintenance as its surface breaks down and develops unsightly pitting. Gold plating is both stable and conductive but is relatively soft and therefore not ideal for regular use. The superior hardness and thinness of rhodium plating makes for a stable amp-cable interface with low resistance and low impact on the signal. Peerless endurance. All the components of this heirloom-grade connector can be cleaned, polished, reused, exchanged, or replaced. A quick polish with 1500-grit sandpaper keeps the shell looking its best. 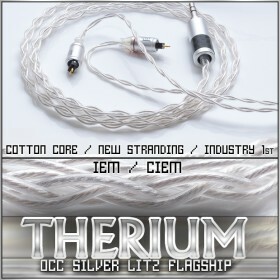 The PTFE insulator and rhodium-encased silver pins are at the height of environmental resistance and wear tolerance. This is connector you will want to reuse – its modular design means it could someday be a 3 pin XLR, bear a different decorative insert, or be used in subsequent cable projects.